The University of Liverpool’s School of Veterinary Science is utilising cutting edge technology to allow students to analyse animals’ internal anatomy, using their smartphones. 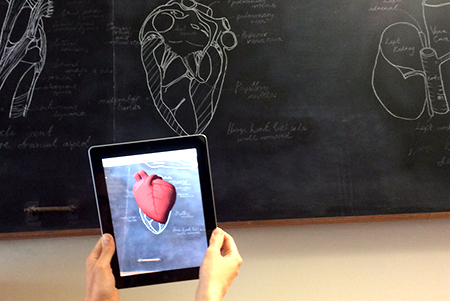 The School, which topped the league table for veterinary science in the Guardian’s 2015 University Guide, is seeking to further enhance its offer by developing augmented reality (AR). AR allows students to look inside an animal by holding their smartphone against an image or other physical source, which then reveals another set of images, such as a video, on their device. Avril Senior is a Lecturer in Learning Technology and Senior Tutor in the School of Veterinary Science, she said: “We are always looking for new ways to engage learners and help them get the most out of their learning experience here. 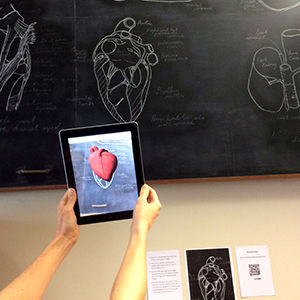 The team developed a 3D image of an equine heart, which is revealed on the user’s smartphone when held up against cardiac drawings; as well as a short video of a horse in the School’s operating theatre that plays when a device is held up to an image of the theatre doors. There is also an image of a horse that, when viewed through a smartphone or tablet, reveals its internal anatomy in three dimensions. Avril said: “Designing guides to aid the understanding of anatomy, and the performance of clinical skills, by producing resources for our veterinary teaching suite and hospitals is the more serious teaching application of AR. So far, the technology has been trialled at Open Days, and plans are in place to introduce it to the School’s new curriculum, which aims to provide world-leading clinical training, underpinned with the latest scientific knowledge. The new curriculum has reduced the number of lectures in favour of more dynamic forms of training, such as ‘scenario’ sessions where students work in groups to tackle clinical problems.